Our Whole30 Approved partners at Primal Kitchen® make delicious condiments, dressings, and oils from nourishing ingredients to help you get flavorful, nutritious Whole30 dishes on the table fast. You save time and effort, and your kiddos scarf down their dinner… everyone’s happy! You can find Primal Kitchen products nationwide in Whole Foods, Sprouts, and Natural Grocer, and locally in Publix and Wegmans. 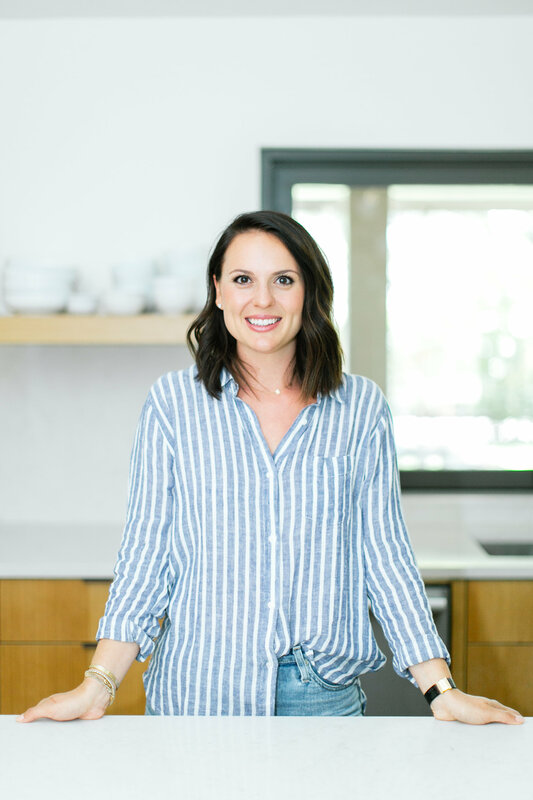 Here, Whole30 pro Alex from The Defined Dish shares her favorite family-friendly Whole30 recipes featuring some of our favorite Primal Kitchen Whole30 Approved products. IN a large bowl combine all ingredients and toss to coat evenly. 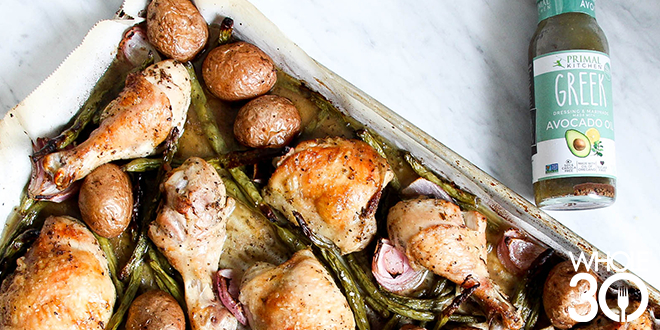 SPREAD contents on a large baking sheet (preferably wrapped in parchment paper). Season the tops of the chicken on last time with a little salt and pepper, to taste. ROAST in oven for approx. 45 minutes, checking at 30 minutes and tossing the veggies. Chicken should be cooked through and golden brown. IN a bowl, combine the mayo and juice of 1 lime. Stir to combine. Cover and refrigerate until ready to serve. IN a large bowl, combine the turkey, salt, pepper, chili powder, cumin, paprika, garlic, egg and almond flour. Using your hands, work the meat until it is just combined. USING a small ice cream scoop or large tablespoon, scoop meat into hands and roll to form 1.5 – 2 inch sized meatballs. Continue until all of the meat is turned into meatballs. HEAT a large skillet over medium-high heat and add 2 tbsp. olive oil. When hot, place meatballs in the skillet (you may have to do this in 2 batches depending on the size of your skillet) and fry on all sides until golden brown, about 2-3 minutes per side. REDUCE heat to low and cover the skillet and let cook until meatballs are cooked all the way through (no longer pink in the center) about 5 more minutes. PLACE meatballs on a cooking sheet covered with parchment paper and bake at 375 for 12-15 minutes, or until meatballs are cooked through. 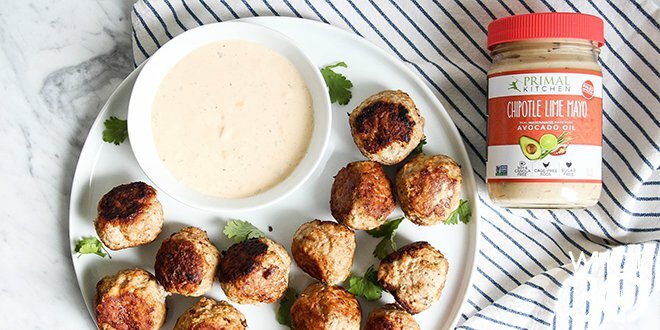 WHEN meatballs are complete, serve with aioli and enjoy! I like to use mine as a salad dressing, while my kids use their as a dipping sauce. You do you. PREHEAT oven to 425 degrees. Season the chicken tenders with salt and pepper all over. CRACK eggs into a large bowl and whisk. IN a separate bowl combine almond meal, coconut flour, salt and pepper (to taste) and paprika. Toss to combine evenly. USING one hand, place chicken tenders into the eggs and coat. Toss into the breading mixture and use your other hand to coat in the breading. Place breaded chicken on a parchment paper lined baking sheet. Continue process until all of the chicken is breaded and on the baking sheet. SPRAY the tops of the chicken with cooking spray of choice. Bake in oven until chicken is browned and cooked through, 20-25 minutes. 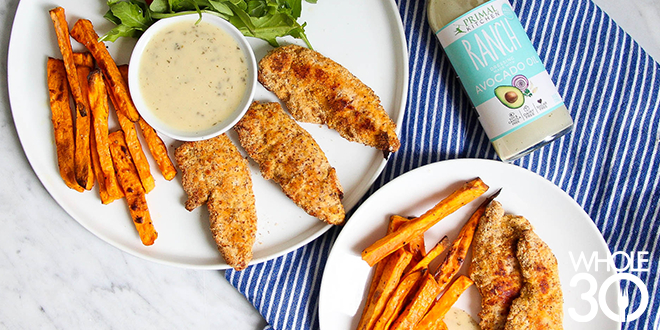 Serve with Primal Kitchen Ranch Dressing and ENJOY! This post was sponsored by Primal Kitchen. Some links in this post are affiliate links, which means Whole30 makes a small commission on items purchased via these links. Thank you for supporting our Whole30 Approved partners! About Alex of The Defined Dish: Food and cooking have always been a passion of mine. Growing up I was always the kid helping my mom in the kitchen, and then in college became the girl cooking and testing recipes for my roommates and friends. Now, I am a wife and mom making delicious, nutritious meals for my family. I did my first round of Whole30 in 2015, and became a huge advocate of the program. It completely changed my relationship with food. Most of my recipes are Whole30 or Paleo compliant, and I stick to a mostly Whole30 diet in my food freedom. But us Texans like big bold flavors—so I never skimp on flavors with my dishes. They’re hearty, healthy and freaking delicious! To me, food is more than just what fuels your body. Food brings joy in our lives because with food we make friends, share special moments with our loved ones, and count our blessings. Sharing my recipes and passion with others makes me happy, which is why I have this little blog. These recipes are made with love and I truly hope you enjoy cooking them in your kitchen.